Making a HTTP GET request is as easy as pie using the WebClient class that is available in the Silverlight library. The DownloadStringCompleted event callback of the WebClient class is invoked on the main UI thread thus allowing the developer to access UI elements in the callback method itself. If the web service call resulted in a failure, then that condition can be easily determined in the DownloadStringCompleted event callback method by checking if the Error property on the DownloadStringCompletedEventArgs argument passed into the callback method is NULL. The code snippet below illustrates one way to use the WebClient class. But when it comes to making a HTTP POST in Silverlight, things aren’t so simple. Silverlight doesn’t come with any helper classes like the WebClient (for making HTTP GET requests) to help take the hassle out of making a HTTP POST. So, to make a HTTP POST request, we must jump through two threads before we get back on the main UI thread where we will be able to access the UI elements and update them as needed. 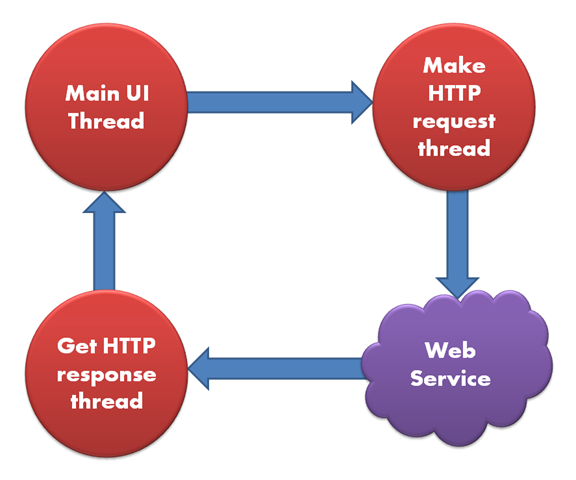 Here is a simple illustration of the process that we have to go through to make a HTTP POST. Before we get into code snippets for actually accomplishing the above, let’s get into a little bit of why the above needs to happen. When the user initiates an UI event (button click etc) upon which we must make the HTTP request, we need to ask Silverlight/browser to open a HTTP request pipe to the specified URL. We get this request stream in a different non-UI thread. The reason for this being that Silverlight makes HTTP requests through the browser stack (Silverlight 3 can use its own HTTP stack if needed, but uses the browser stack by default). As you might know, browsers limit the number of outgoing HTTP requests to a given domain name. This limit used to be 2 but modern day browsers have increased this limit (8 in IE8 etc). So, given this limit on the outgoing HTTP requests, there is no guarantee that the browser can open a HTTP request pipe to the URL when demanded by Silverlight. So, we end up getting the request stream in a non-UI thread. We can write/post the necessary data to this request pipe and wait to get a response from the web service. The results from the web service is received on another different non-UI thread. Once we read all the information from the response stream, we can’t start updating the UI elements since we are still on a non-UI thread. So, we need to pass this response from the web service back to the UI thread before we can start updating the UI elements. Since, we need to pass data between threads as explained above, I had written these tiny little classes to help us through the process of making the HTTP POST request. We need to store away the SynchronizationContext of the UI thread before we begin making the HTTP POST request and start jumping threads. This is so that we can get back on the UI thread when the HTTP POST web service call has returned. So, create a variable to hold the in the SynchronizationContext Silverlight UserControl. The following code snippet illustrates how to use the HTTPWebRequest and the HTTPWebResponse classes in Silverlight to perform the HTTP POST. I will be posting more helper methods for the above pretty soon. Also, I will delve more into making HTTP POST requests to WCF REST endpoints in future posts.